Atlantic Biocuda Colorfalls & Fountain Treatment 8 oz. 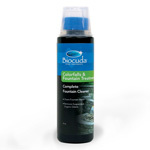 Atlantic Biocuda Colorfalls & Fountain Treatment clears water fast! For use with Colorfalls and all Pond-free fountains. Home / Product Types / Fountains / Maintenance & Accessories / Atlantic Biocuda Colorfalls & Fountain Treatment 8 oz.